The successor to the popular NSX610 exam went into public beta last week with with a staggered roll out starting in the US. Access to the consoles of all VMs – however function keys are disabled so you can’t log into most of them at this time. Run through HandsOnLabs especially HOL-SDC-1603 and set your screen to 1024×768 to practice optimizing the environment. Note that right-click, Control, Alt and Function keys are blocked in the exam so get used to menu options and other workarounds. Don’t skip around in the exam until you’ve attempted all of the questions. Note that skipping around is *far* easier with the new interface. That said, skip the items you need the PDFs or html doc links until you’ve done the ones you know. This entry was posted in Certification, Computing, Network, Virtualization, VMware. Bookmark the permalink. 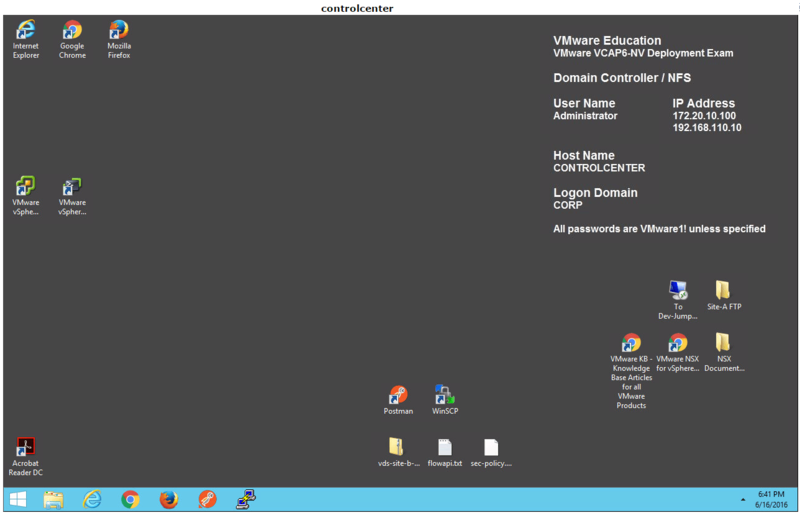 Will a practice lab exist like the one available from you for VCAP5.5? The VCIX will be upgraded To VCIX6-NV automatically? Should happen when VCIX-NV goes live. Hello, i keen to practice for the VCAP6-NV exam, is the practice lab available or not yet? And if it is not yet available what are your suggestions that i can follow for me to practice till the practice lab be available? mentioning that i have a DELL Precision laptop with 32 Gigs of RAM yet i still believe it is so hard and complicated to build a nested lab using it. is the VMware Hand on Lab HOL a good choice ? HoL is your best bet for practicing with a complete environment. It will provide the closest experience to actually taking the exam. Joshua, I see that the new HOL-1700 series are somewhat different in naming convention to the HOL-1600 series, for the purpose of 3V0-643 exam practice are we best to stick with the older 1600 versions (1603, 1625…)?